AVID Soccer and adidas are proud to congratulate Jonathan of California as an AVID Soccer Fan. Jonathan learned about futbol while serving in South America. The Chilean people shared their passion with him and it has continued to grow ever since. Read the story that earned Jonathan a Jabulani ball by sponsored by adidas. It all started in the early 1980′s while serving as a missionary in Chile, South America. During my year and a half there I never saw a grass soccer field. They were all dirt! I wondered why. It finally came to me that grass just could not grow when the fields got so much use. Many of the players had no shoes, but this didn’t seem to matter. The sport looked simple enough, so I began to join in. I soon gained a great respect for what these kids could do with their feet. I found that after a year and a half I could barely keep up with kids between the ages of 10 and 12. I was 23 at the time! When I returned home to the US, I found a group of mostly Hispanics playing “Baby Football” ([futsal] played on a basketball sized court) at the local YMCA. I was the worst players out there! 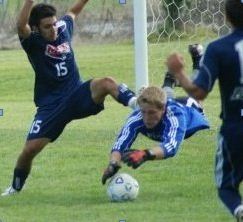 Within a few years an adult league was forming and I was asked to play Keeper. I had good hands from my High School [American] Football days. It took years, but I was invited to play on the field and found that I was a decent defender. One day, a top club asked me to join their team as a defender. I was honored, and felt that all my soccer aspirations had materialized. They actually wanted ME to play for them. About this time, my children were getting old enough to play. I decided to lend a hand as an Assistant Coach. 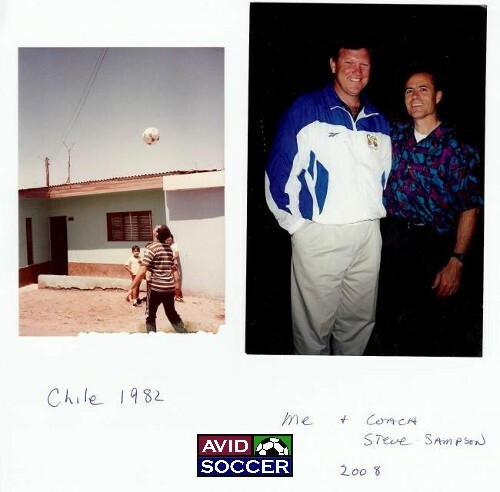 I found that I knew much more about the sport than many of the other AYSO coaches, and was one of the few that had ever played, or was now playing. My boys were very athletic, and were willing to put forth a great effort. I felt like I needed to clone them and have them all over the field… but soon learned that if I could help the other players around them improve, we could work better as a team. That became my philosophy: “Take each of the players on the team, and leave them better than I found them.” I concentrated on teaching them the basics many times, because bad habits had not been recognized or corrected in the past. Some of these young kids were like “old dogs” that didn’t want to learn any new tricks. Slowly but surely they began to trust and listen to me. My favorite player is the one that will take instruction and try to implement it. I have had some less talented players who would do whatever they were asked to do. And, I prefer them to the very talented player that will not listen. Over the years, we developed several championship teams, and saw a lot of growth among the players. Over time the kids recognize that it isn’t just kicking a ball. There can be so much more to it. The more they learned, the more they realized they still needed to master. This is a sport that just gets better and better. I love every aspect of the game.. from playing, to coaching, to watching great soccer on TV. With the World Cup right around the corner, we just got our cable turned on and the only reason is to watch the greatest game ever played. We will turn it back off once a champion is named. I now have the pleasure of playing adult league soccer with 4 of my oldest children.. They now coach me! AVID Soccer and Calle Republic are proud to congratulate Jason from Tennessee as the winner of the AVID Player story. Jason persisted in his soccer passion in small town America where there was not a lot of support or teammates. AVID Soccer releases a few contest entries to encourage readers to participate.